I joined a few grief groups on FACEBOOK after Mom and Dad died. I'm not sure what I joined when, but I know I was seeking words that made me feel better, helped me understand the loss I was feeling, gave me tools and language to express the way I was ripped apart. I don't read them much anymore, I don't feel a need to. That's probably good, a sign of healing in my heart and brain. Sometimes I see a tumblr like info graphic - words on a moody image that evoke a tear in my eye, or a nod of my head. Sometimes I repost them, an egoists homage to my mood. THIS IS WHAT I FEEL AT THIS MOMENT BEHOLD, INTERNET, AND MOURN WITH ME. I've noticed lately, however, a trend that I never noticed until it was mentioned to me. A friend made a casual remark how people always assume it was easier to lose a parent as a child, because you hadn't known them that long. I was truly shocked by this. I don't even know if I expressed HOW shocked I was, actually. I can't imagine losing your parent at the age when they are such a huge piece of your life as they are in childhood. I digested that information and noted I hadn't really noticed anyone saying things like that, and mentally hoped "I" hadn't said something so insensitive. Grieving people tend not to think before we speak though, so maybe I have. That's when I started noticing it. In a bit of melancholy as Dad's birthday is upon me in three days I've read a few "Let me tell you stuff about losing a parent" type of articles, bullet points of stuff you should know about how you'll change, how you should treat your friends going through this stuff, just personal PoV pieces about death and grief and what you wish you had known. Over and over again, I see mention of "it would have been easier if I had been a child." I just can't imagine making that sort of leap. I suppose the author wants that to be true, they want there to be an easier version of this pain and loss gnawing at the core of their being, I think that's one of the big mistakes we all (including me) make about grief. We want to translate our experience to others, and we want to give the language of our own understanding to others. Except it doesn't work that way. If you and I stub our toe HARD on the leg of a big heavy table, it hurts both of us. We have varying degrees of pain sensitivity, varying degrees of strength in our bones. We might hit our toes at different angles, we might hit it with different force. I can tell you about my toe pain but you can't feel it. And I can't say my toe hurts worse than yours because I can't TRULY know how your toe feels. I can make a guess based on my own experience but that doesn't make me RIGHT. I can't tell you how long your toe should hurt, how you should or shouldn't limp. I certainly can't tell you it would hurt less had you stubbed your toe as a child. When my Mom died I knew she needed to die because she was suffering. I knew my brother and sister in law had done everything under the stars to make the end of her life exactly as she wanted in her circumstances. I could not have asked for anything more from anyone, other than my mother not to be suffering and dying in the first place. I was devastated, regardless. It would not have been easier had I been a child. It would be easier by the time I was 47 - PERHAPS. Perhaps not. I can't say either way. I know that when I looked at the people I knew who had lost a parent as a child, I looked to them as pillars of strength. I knew they had suffered my same loss, at an age I couldn't comprehend dealing with such a loss. I looked to them and knew that if they could survive this thing, I too could survive it. Not once did I think "Oh look at them, how lucky they were a child." When we're talking in the language of grief, I think it's important to qualify our words with more sensitivity than we might normally do. We can't presume to tell other people how to feel. We can't presume to infer that how WE feel is normal or right. Grief is individual. 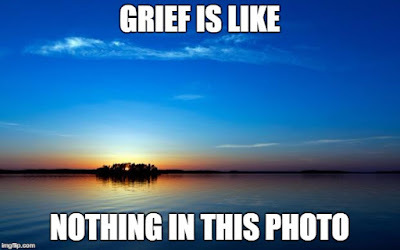 Grief is not a set of stages. Grief is the next stage in your life. I think part of the time it's crippling and part of the time you don't notice it but it never leaves. It becomes part of the new you. And nobody, but nobody, can tell you what would make it easier. I did make a motivational image for you. Enjoy.